Veetle, a peer-to-peer video technology uses a proprietary plug-in in order to see their streams, usually at exceptionally high quality. On the iPhone, iPod touch and iPad, browser plug-ins are not available. Thankfully, Veetle provides some of the videos using HTML5 and Apple’s HTTP streaming which in English means “live high-quality streaming video on your favorite toy’s browser”. The quality is top-notch. At some point recently, they enabled AirPlay on the streams in their website; or maybe it’s an iOS 4.3.1 thing, but it didn’t work last time I tried it. This means I can finally send live video from my iPhone/iPad to my Apple TV. Since the TV in my room is hooked up only to an Apple TV, this is great. And the quality is very, very good. Bonus tip: Exit Safari to use another app or open another tab while the video is playing on the Apple TV. Playback will stop, but you can double click on your Home button in order to bring up the multitasking tab, swipe to the playback controls, and resume your video in the background! Apparently Apple has announced a new product called iPad. It’s like a big iPod touch. Having owned all three iPhone models I must admit I would probably enjoy owning an iPad, limitations and all. As it is, I already use my iPhone more than I use my laptop anyway: when I wake up, I check my email on my iPhone, not on my laptop. When I want to see the weather, I check it on the iPhone, not on my laptop… The list goes on. When I use my laptop, most of the time I use it to watch video or browse the internet in bed or in the living room couch. 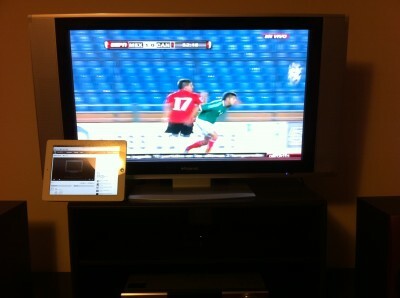 The iPad should do all these things more comfortably than my laptop. The only thing it’s really missing for me is a webcam for videoconferencing. I’m not saying that it will replace my laptop… but it may end up being an additional toy.